As promised, here is the second half of the results from our insect week back in July. Back in September, I reported that it appears bees are using our restored prairies much as they do our remnant prairies. That’s particularly important because our prairie restoration objective is to functionally enlarge and reconnect our remnant prairies by restoring the cropland around and between them. That objective can only be reached if insects and other creatures in our remnant prairies are using restored areas as habitat. Besides bees, the other group we focused on during our insect week was ants. James Trager (biologist and naturalist at the Shaw Nature Reserve in Missouri) and Laura Winkler (a graduate student at South Dakota State University) were here to help us start an inventory of the ants in our prairies and – more importantly – to begin evaluating our restored prairies as ant habitat. As with the bees, there’s still much to learn, but the news so far is good. 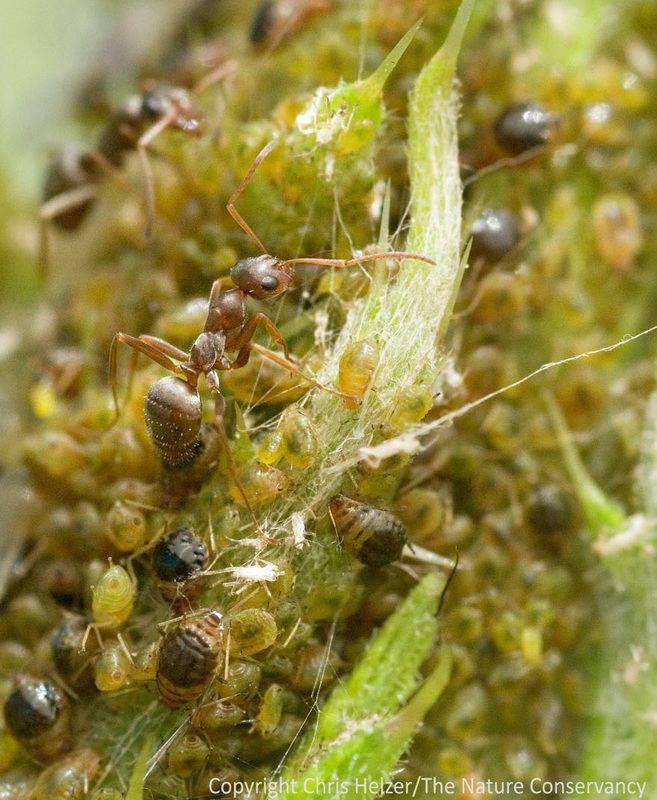 Mound building ants (Formica montana) tending aphids on bull thistle. Platte River Prairies, Nebraska. We found 22 ant species in three days of sampling. You can see a summary table of the results here. Four of those ant species were arboreal (tree-dwelling) and were found only around one of the houses on our property. Of the eighteen remaining species, ten were found in both remnant and restored prairies, five were only in remnant prairies, and three were only in restored prairies. We obviously need to follow up on the five species found only in remnants to see if – as I hope – we just haven’t yet looked hard enough to find them in restorations. Regardless, thirteen of the eighteen ant species we found in our grasslands were living in restored prairies, and that’s really nice to see. It appears that our restored sites are increasing the size and connectivity of prairies for at least those thirteen species of ants, which is an important measure of success. The patchy habitat types within each of our prairies makes the results even messier than they otherwise would have been. James pointed out that the sampling we did – though often along transects – was from small enough portions of each prairie that we don’t yet have good representative data from each site. 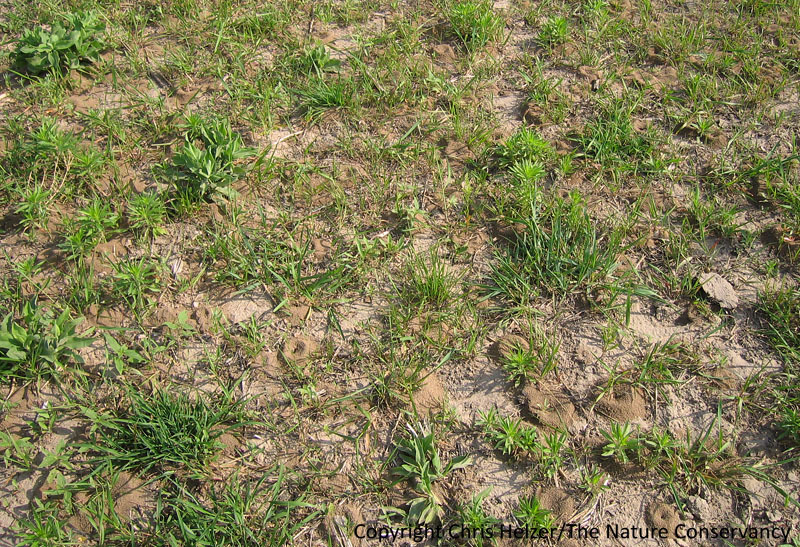 Many of our prairies vary considerably in terms of soil type, topography (including depth to groundwater), and management history, each of which could have effects on the ant species found. Until we get more widespread sampling from some of these prairies, we just have a small snapshot of what’s going on. So, on the one hand, we should be able to find more species in each prairie as we keep looking, and perhaps that will indicate stronger differences between ant communities in restored vs. remnant prairies. On the other hand, even the very preliminary sampling we’ve done shows more similarity between the ant communities in restored vs. remnant prairies than I would have thought. At this point, we’ve found fifteen ant species in our remnants and thirteen in restorations. Looking at these early results in a larger context, there are about 120 ant species that have been found in Nebraska. We’ve found less than 20% of those species in our prairies so far. Given the diversity of habitats we have, from wetland to sandhills, it seems likely we’ll find more ant species in our sites. In particular, James was surprised not to find three species that he nearly always sees in prairies, and that are on the Nebraska list. Those species are Crematogaster lineolata, Monomorium minimum and Temnothorax ambiguus. (I’ll bet most of you reading this are surprised by that too, aren’t you?) Maybe they’re here, maybe they’re not, but not seeing those three otherwise common species could be a clue that we’ve still got a lot of looking to do. A couple years ago, I wrote a post about the density of ants in our restored prairies. That post was based on some photos I’d taken of ant hills a few days after one of our restored prairies had been flooded and dried out again back in 2005. At that time, James commented on the post that most of the ants were likely Lasius neoniger (the cornfield ant), a typical early colonizer of young prairie seedings, that usually cedes territory to a more diverse ant community as the prairie matures. It is particularly nice to note that the highest diversity of ants we found in any prairie this summer (yes, I know it was very limited sampling) was in that same restored prairie. My photos from 2005 aren’t solid evidence that the prairie was dominated mostly by cornfield ants back then, but James’ 2012 sampling certainly shows that the ant community has diversified since. Recently rebuilt ant hills in a restored prairie – a few days after flood waters receded. Like a kid who’s just had his first taste of chocolate, this summer’s initial insect collecting has gotten me excited to do more. Questions are swirling in my head… It also makes me want to expand the kinds of creatures we’re using to evaluate our restoration work. Small mammals would be fun, for example. What about snakes? And there are enough invertebrate groups to keep us busy for a long time, including spiders, leafhoppers, springtails and many many more. It’s going to be a long winter of dreaming before we can get started on any of that. Thank you to James and Laura for getting us started on our ant inventory, and (again) to Mike Arduser for his help with bees. Thanks also to Prairie Biotic Inc. for helping to fund this effort. It was a thought provoking and energizing summer, and hopefully just the start of a long and interesting road ahead. This entry was posted in Prairie Insects, Prairie Natural History, Prairie Photography, Prairie Restoration/Reconstruction and tagged evaluation, grassland, insects, james trager, measuring success, nebraska, platte river prairies, prairie, prairie ants, prairie reconstruction, prairie restoration by Chris Helzer. Bookmark the permalink. Or just maybe … it means the Platt River Prairies are unique and even more special than first thought. For what it’s worth, M. minimum is also abundant in my back yard near St. Louis, but was nowhere to be seen on the surface when I returned home, so perhaps estivating. T. ambiguus belongs to a group of mostly cool temperate species, so maybe also hiding from the heat. OK, so maybe only the Crematogaster is surprising for its absence. Its genus categorically loves the heat! And here’s some more on prairie ants (from Konza) which may have some bearing on the Central Platte prairies http://myrmecos.net/2013/05/14/konza/.